The recently opened facility run by Adam and Renie Cohen, is designed not just for unicycling but, is devoted to the sport of balance. We were all delighted to ride around and try the different balance devices available. I was pleasantly surprised to see Ziggy has lost his title as the youngest unicyclist in the northeast to his younger brother Ikey. Ikey was riding around (video) room as a solid level one unicyclist. He can even free mount his little 16 inch unicycle. We were hoping for more club members to take advantage of the opportunity to ride indoors. 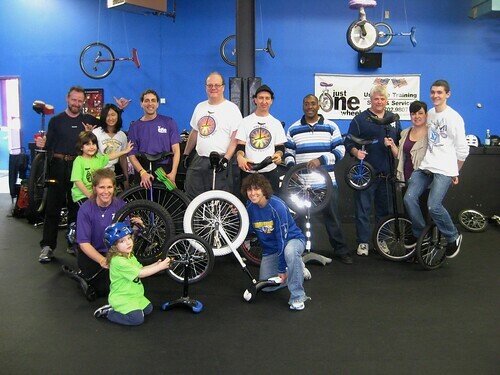 Particularly some of members that are new to unicycling. But there is always next time. Be on the look out for another invitation coming in the fall to experience the fun of balance at their facility located in Plainview Long Island. Check out my earlier article for more details and links regarding Just One Wheel. Click on the photo above for a slide show of the rest of the photos made available on our Flickr site.